In January 2011, there were 17,000 children in foster care in the State of Illinois. The majority were placed in relative foster care, yet nearly 7,000 were placed in non-relative foster home placements. These children and families require compassionate expert care in a time of great uncertainty, trauma, and upheaval in their lives. The Center for Youth and Family Solutions provides collaborative, strength-based, client-focused, clinical and casework services to those involved with the Foster Care system. Our therapists and Family Workers have been trained in a comprehensive understanding of child development and evidenced-based, trauma-informed treatment interventions. In addition, they have a strong understanding of cultural differences and work respectfully with all families. Our eco-systemic approach encourages work by our Family Workers and therapists with all parts of the system: foster children, biological parents, and foster parents. We also collaborate with relatives, schools, daycare providers, medical and healthcare providers, neighborhood groups, churches, housing services, substance abuse treatment centers, legal services or any other community provider as needed as part of a team approach for the well-being of the family. Every family is part of a community and often a lack of connection to natural support systems has contributed to the issues. It truly does take a village to raise a child. The Center for Youth and Family Solutions works with parents whose children have been removed from their care to assess their strengths and needs, set goals for change, find resources to address the issues that put their child at risk, improve parenting skills, and provide a safe, stable and nurturing home for their children. 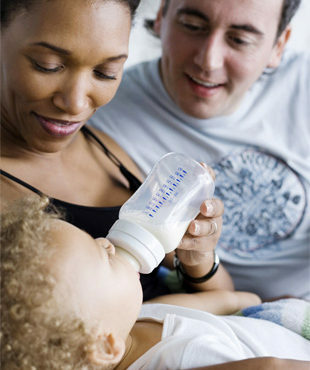 Our professional staff understands how important it is for families to maintain a bond when out of home care is needed. We try to keep siblings placed together and keep the parents as involved as possible so the routines for their children can remain consistent. 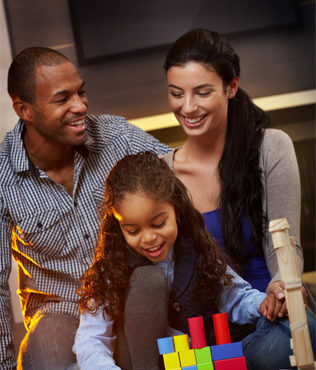 Each family has their own unique characteristics and is evaluated based on their individual needs. “Alyssa”, a 21 year old mother, was referred to CYFS from the Department of Children and Family Services when her six month old baby was removed from her care. Alyssa had been living with her boyfriend “James” for several months and he had a long history of criminal involvement including violence and drug dealing. There had been repeated instances of domestic violence. This lifestyle had placed the baby at severe risk of being harmed and the infant, “Danielle”, was placed with a CYFS licensed foster family. From day one, the foster parents “Amelia and Joe” recognized the importance of this young mom to remain closely involved in her child’s life. They welcomed mom into their home frequently so she could continue to assist with the daily care of her baby. While under the supervision of the foster parents she was able to feed, bathe, dress, play, and soothe and bond with her daughter every day. The foster parents were also able to provide mentoring and support to mom as she learned how to safely parent her baby and make healthy choices in her lifestyle. Alyssa worked closely with her Family Worker, Beth, and therapist, Kim, to develop a plan to address her own issues including repeated bad relationship choices, depression, and alcohol abuse. She began work part-time, and also started work to finish her GED. Her goal became a career in nursing and she hoped to enter training at the local junior college. She made a plan in her therapy to work on her depression and past abuse that she experienced as a child growing up. She began to learn how to be a nurturing and consistently loving parent for her baby. She was determined to break the cycle. Her baby Danielle’s life was going to be different. She finally made the difficult decision to leave James after he refused to participate in getting help and changing his lifestyle. She loved her baby and knew that staying with him would hurt both herself and Danielle. The foster mother, Amelia, gradually became the support and mentor that Alyssa never really had in her life growing up. Amelia taught Danielle that she had to respect herself and help her daughter to grow up respecting herself. Living in a relationship with someone who hurt her and put them at risk was the wrong message and the wrong life for her daughter. She began to attend church with Amelia and Joe at their local church- The Church of the Living Waters. She met other young parents there and joined a young parent social group. She was able to find a new place to live with the help of her Family Worker Beth in a housing complex near where some of her new friends from church also lived. She felt safe for the first time in her life. After 12 months of working toward her goal to have Danielle returned home to her-she was ready. Amelia and Joe helped Alyssa get the baby’s room ready for Danielle. Danielle was now 18 months old. Alyssa met a licensed in-home daycare provider at church and had a plan in place to continue with school. Amelia and Joe were instrumental in assisting Alyssa with her life changes and were as excited and proud about the reunification as she was. These foster parents maintained a strong relationship with mom even after Danielle returned home. They continue to be mentors and provide emotional support, and Alyssa considers Amelia and Joe as extended family to this day. There are many stories of reunification, joy, and hope for the future for parents and children each day at CYFS in our work with families involved in the Foster Care system. Like each of us- Alyssa cannot do it alone. It is through the deep caring and commitment of foster parents like Amelia and Joe, through a compassionate church congregation, a dedicated Family Worker, a caring therapist, a daycare provider she can count upon, and her own perseverance that she is making a new life for her daughter. With the support of many, Alyssa remains committed to her goal that life will be different for Danielle.